I would assume this place has walls and a ceiling, so you can't see one room from another, but whatever. b)Awesome Cube-like wire trap with Valkyries singing in the background. h) Three death mandalas! And five minutes to figure them out. 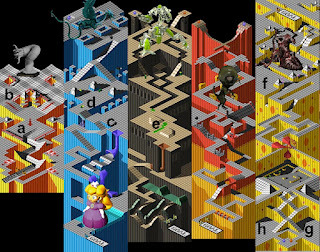 You have given me such a nerdboner by using the Marble Madness Map. a- The non stop dance party of the murderous damned. b- Living Rack Trap with barbed-wire staps; their whistle through the air sounds like babies crying. e- Mirror of the Riddle Becoming: any answer to the riddle is acceptable, answerer will be bestowed a "gift" of their answer. g- gain a cursed reputation of bad luck and failure unless they successfully eradicate all seventeen Whisper-Rats. h- Weird Sisters and Deadly Venoms.